To the shock of many it was announced earlier this year that the WMCQ would be replaced by the return of Nationals and even more surprising is that the format will be split between draft and standard akin to the Pro Tour. Avid draftaholics might feel prepared for the limited rounds on offer at Nationals, but with half of the tournament as standard constructed – How are you supposed to prepare for that? Well maybe we can help. 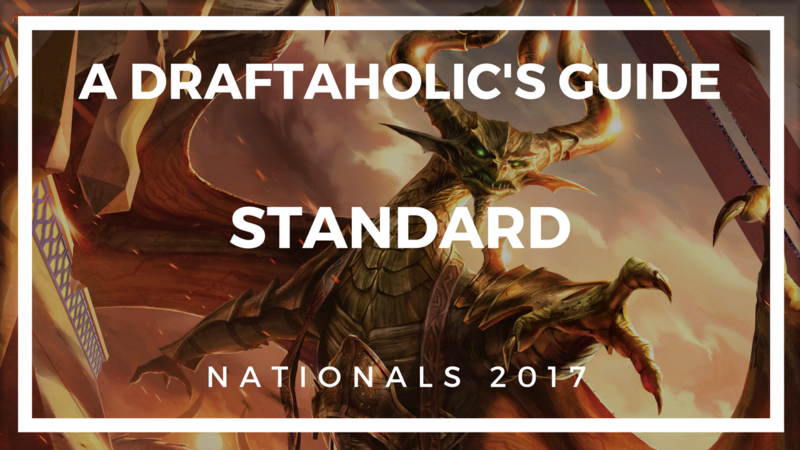 The team at Draftaholics Anonymous have put together the ‘Guide to Standard’ series for anyone looking to get an edge for Nationals. From the newest player, to the most experienced grinder, this guide will help you understand the ins and outs of standard, the cards to look out for, the decks to play and the decks to beat. Read on and let’s learn together! Green Black is, in essence, a midrange deck that utilises some of the best removal spells available in standard, alongside creatures that generate additional value. This archetype comes in many flavours ranging from a delirium build which relies on Grim Flayer and Traverse the Ulvenwald, to energy where Longtusk Cub and Glint-Sleeve Siphoner shine or even a purely +1/+1 counter based deck discussed in detail below. The strength of GB comes in its high card quality, and must answer threats at all points on the curve such as Verdurous Gearhulk or Winding Constrictor. Opponents are forced react to the swift pressure GB is able to apply, while also being conscious of the decks ability to transition into a slower, grindy deck. The best ways to combat GB are with sweepers to stall their early aggression. GB can struggle to keep up with decks that go wide with multiple creatures as it is often building up power and toughness and one-for-one removal isn’t as effective to deal with multiple opposing creatures. GB also has a tough time in game one against control decks with counterspells and few creatures as removal spells will be dead draws. In the current meta where Zombies and Ramunap Red are the decks to beat, GB players are not afforded the time for cards like Grim Flayer and Tireless Tracker to shine. To combat this we’ve opted to shave the number of maindeck Tireless Trackers, and looked to Sylvan Advocate and Catacomb Sifter to fill the role of Grim Flayer. These creatures have 3 toughness which is relevant against mono-red, and Catacomb Sifter provides additional value by ramping towards Verdurous Gearhulk. Strengths: Explosive starts if not interrupted. Great removal. Weaknesses: Weak to board wipes, hard control or very fast aggro. This archetype is a mono-red list that aims to whittle down your opponent’s life total quickly using cheap haste creatures like Bomat Courier and cheap burn spells such as Shock. There are parallels that can be drawn to Modern burn, however the card quality is not nearly as strong in standard. The strength of this deck is its ability to punish slow or clunky draws from opponents by ending the game quickly without giving the opportunity for them to catch up. Ramunap red also consists of many creatures that make blocking difficult, or occasionally impossible with cards such as Earthshaker Khenra or Ahn-Crop Crasher, so don’t rely on this as your best way to beat it. This deck also has the reach required to end games when your opponent has stabilised with cards such as the deck’s namesake Ramunap Ruins or activating Hazoret the Fervent ability. This archetype does have weaknesses if you are looking to beat it. Board sweepers are difficult to recover from if your opponent is still at a high life total and the deck is also weak to lifelink on opposing creatures. As Ramunap Red is forced to invest in its board state for big attacks combined with burn spells to end games, opponents leveraging lifelink or sweepers can greatly reduce the impact and card quality that the red deck can produce. Strengths: Punish slow starts from opponents with cheap creatures and burn for added reach. Weaknesses: Lifegain, board sweepers and removal. Mono-black zombies is an aggressive tribal deck at first glance but often plays out its games as a midrange deck. Its strength comes from having powerful creatures to cast at each point in the curve that have huge impacts on the game, starting with Cryptbreaker all the way down at one mana. The deck plays multiple ‘lord’ effects which can quickly increase your undead army’s power and toughness. Similarly to Ramunap Red this archetype is able to take further advantage of its land slots by including utility lands such as Ifnir Deadlands and Westvale Abbey, adding power to the deck without having to sacrifice other spells to make room. The deck gains power from the synergies provided by cards like Diregraf Colossus, Liliana’s Mastery or Lord of the Accursed generating zombie tokens or increasing their power and toughness, giving the zombie player a significant advantage. The deck can struggle to close out matches against Ramp and Control variants due to their density of sweepers and superior late game spells. Metallic Mimic has fallen out of favour with Abrade being a predator in the format, where Kalitas has found a home in its place. The four toughness is difficult for other aggro decks to deal with, and the additional value from the token making ability or lifelink can swing matches in your favour. Weaknesses: Board sweepers and removal spells that target key synergistic creatures. This archetype looks to spend its early turns castings spells that put additional lands into play such as Beneath the Sands or Hour of Promise, or casting enchantments that produce additional mana, ramping you and allowing you to cast big creatures ahead of schedule. The strength of this archetype is the ability to cast finishers like Ulamog the Ceaseless Hunger as early as turn 6 utilising multiple Shrine of the Forsaken Gods and ramp spells on earlier turns. This deck can be weak to aggressive opponents as ramp is often wanting to spend the initial turns playing spells like Weirding Wood or Beneath the Sands, which have no immediate impact on the board. Spells like Hour of Devastation or Kozilek’s Return are included to cover this weakness. There are two variations of the GR ramp, each of which chooses between playing creatures that produce mana or Hour of Devastation. The archetype is forced to choose due to the anti-synergy between the two; Many are deciding on Hour of Devastation in the current aggressive standard meta. Strengths: Casting Ulamog before turn ten. This is an aggressive mono-white deck looking to exploit Ramunap Red’s dominance on the current standard format with a life-gain sub theme that synergises with Crested Sunmare and Lone Rider. This deck is able to apply pressure to its opponent’s life total with aggressively costed creatures and Always Watching providing a power and toughness boost and vigilance. Combined this with lifelink and the mono white player will never lose a damage race. Mono-white is weak to board sweepers, or targeted removal preventing lifegain as the synergy from lifelink is mitigated. Weaknesses: Board sweepers and critical mass of one-for-one removal. Temur energy is a midrange deck with a mix of creature and removal spells. This deck takes advantage of the energy mechanic from Kaladesh to play powerful, resilient threats like Longtusk Cub and Bristling Hydra. Cards like Rogue Refiner and Chandra, Torch of Defiance are included to provide card advantage, and Skyship Sovereign and Glorybringer are haymaker threats. The strength of this archetype is the value offered by the cards at its disposal. Cards such as Servant of the Conduit and Whirler Virtuoso provide incremental value through the course of a game which then enable the energy pay-off cards like Bristling Hydra or Longtusk Cub to close out the game as they are extremely difficult to remove if there is energy stored. Temur can be weak to decks that can provide a stream of blockers as many of the threats do not have ways to push through damage if Rhonas the Indomitable is not included. Temur is one of the key decks in standard right now and you should plan any sideboarding with this deck in mind. This is further reinforced as the deck dominated GP Denver with three copies in the Top 8. Strengths: Difficult to deal with threats (“sticky” creatures and creatures that generate value). Weaknesses: Chump blockers or deathtouch. – Digging through your deck for Trophy Mage and the Gate with cards like Insolent Neonate or Cathartic Reunion. This deck is powerful because it’s able to cheat on the mana cost for the God-Pharaohs Gift and produce an almost endless swarm of creatures from the graveyard providing inevitability. GPG wins plenty of games just by casting its creatures, many of which generate value when they enter the battlefield such as Angel of Invention or Cataclysmic Gearhulk. The deck is vulnerable to artifact removal spells like Abrade and Dissenter’s Deliverance if combined with pressure from an opponent. Graveyard interaction such as Crook of Condemnation can slow down this deck as it will take more time to set up. This deck is most powerful in a meta with a lack of maindeck cards which interact with artifacts or graveyards. Strengths: Difficult to interact with. Late game inevitability. Weaknesses: Artifact and graveyard interaction. This control deck leans heavily on Approach of the Second Sun as its primary win condition, leveraging card selection spells like Glimmer of Genius and Supreme Will to find the win con, or to dig for answers to the questions your opponent is asking. This archetype is able to run multiple copies of Fumigate, severely neutering the closing power of the aggressive decks. Additionally, it’s quite difficult for an opponent to interact with the win condition, especially in game one, therefore UW Approach does not rely on Torrential Gearhulk to win a game. UW suffers from missing land drops as it can be difficult to recover when your opponent gets ahead. The deck is also weak to opponent’s counterspells and well-timed discard to interact with the win con. Strengths: Win con is difficult to interact with. Board wipes such as Fumigate. Weaknesses: Missed land drops, discard and counterspells. but hopefully this has given you a leg up, and pointed you in the right direction for choosing a deck as well as helping you decipher the metagame. We know you’d rather be drafting, but just think; do well here and you have a shot at drafting on the Pro Tour! Thank you to everyone that contributed to this guide and good luck at Nationals!